Everything you’ve been hearing is about that uptick at the end. But I’m not willing to declare an economy that has yet to recover to the pre-crisis level of GDP an economic miracle. Basically, here’s the German story: it’s an economy that didn’t have a housing bubble, so it wasn’t caught up directly in the bust. But it’s very export-oriented, with a focus on durable manufactured goods. 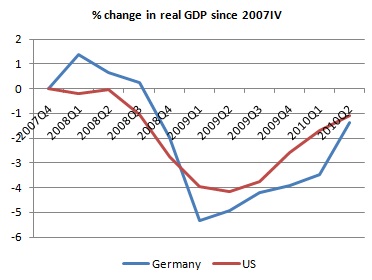 Demand for these goods plunged in the early stages of the crisis — so that Germany, remarkably, had a bigger GDP decline than the bubble economies — but has bounced back since summer 2009. This has pulled Germany back up; exports to China have done especially well. The giveaway line in Brooks' column is "natural experiment." There's no such thing as a natural experiment in macroeconomics. You can have a natural experiment in micro-economics -- treat one group of workers one way, and treat a control group a different way. But whole economies are too large to run experiments with -- there are always innumerable other factors at play.